I don't think the attic-pex domestic water preheater will be taking off anytime soon, common sense will kill it. By the time you've installed everything required for this system, all you have to add is $500 for a solar collector, and voila, you have a real solar system that works all year round. I suppose it might go over better with HOAs. 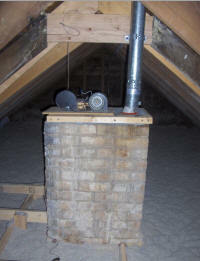 Have you seen any attic heat recovery methods that do work? This fall I'm going to try closing off the back of a couple rafter bays with polyiso board with inlet at bottom and outlet at top to see if it makes a simple thermosyphon collector. If it works, idea would be to collect hot air in a plenum along the ridge and then use duct and fan to blow the heat into living area. I used to live in a house that almost got no sun; an old style villa with its northern (I am in dunedin, new zealand) side built 1.2m from the neighbouring house, with no windows on that side; it had poor insulation as well. Due to a government scheme, the landlords got decent insulation put in the ceiling space, and a moisture barrier and reflecting layer under the house. The house was freezing; basically an ice box in the lounge, where the attic space man hole access was. The roof was dark grey decramastic tiling over the top of an existing iron roof. The house had a chimney in the lounge (double sided brick) which i removed. I designed a system in C#, using Dallas one wire sensors and my HTPC; serial in took temperature measurements from the ceiling, the lounge and one from outside for fun; I used a program called log-temp to spit out xml files which my c# program read every 10 minutes to control a parallel port based relay system. This, in turn, controlled a bilge fan connected to a computer PSU in the roof space - i replaced the existing manhole cover in the lounge with one made of Medium density fibre board with a vent for the fan. The difference in the house was massive - basically made the place livable. The roofspace on a reasonably sunny day often got to the 45 degrees celcius mark, and even with the outside temp reaching only 12 degrees or so, the house would stay at 20+ degrees celcius until late evenings when we went to bed. We gained roughly 7 to 10 degrees on a day with sun over not having the unit, and of course the house was drier and easier to heat due to the removed moisture. A simple differential controller and a bilge fan can make a MASSIVE difference in the right house, thats for sure! Thanks Brendon -- nice to know there is some real potential there for a simple system to work at least in some climates and homes. Attics have two strikes against them. #1. Attics are typically poor solar collectors because they must be vented by code. That means that when they heat up, the warm air spills out by design. #2. New codes allow unvented attics, but also require impermeable insulation at the roof sheathing plane. That kills all solar collection potential. Agree with both points, but I wonder if one could monitor attic relative humidity and find a reduced level of attic ventillation that allowed for more heat collection without moisture problems. For the 2nd point on new construction it seems like ther must be a good way to integrate a collection channel below the roof deck but above the impermeable insulation that should allow for fairly efficient collection -- at least as efficient as an unglazed collector can be. I plan to do some experimenting in my attic this fall/winter with using some of the rafter bays as collector channels. Dave in VA (who has a very nice logging system plans to do the same. With all that area, it just seems like there has to be a good way to make use of it.